Spicy Indian Omelet - Its HOT! If you are an omelet lover, you really enjoy this recipe. This very love for omelet made me start 101 omelet recipes. I was reading a cookbook, the other day for Vietnamese recipes. Though most of them required meat, the book had a great deal of luring recipes. In the Indian section, I found this spicy omelet recipe. Really spicy! 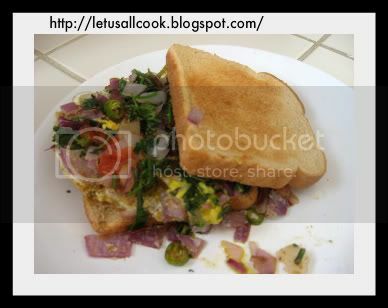 I would suggest you to prepare the omelet the same way, without altering the spice level. It tasted great! If you are a spice lover then you ought to try this.OK, enough of praising, lets go to the details. Beat the eggs along with the milk. This makes your omelet fluffy! Take a scoop of the beaten egg and pour it in the pan. Immediately sprinkle onions, green chillies and tomatoes. Add the spices and cook it in Sim flame. Finally garnish it with cilantro! You can eat them with bread for your breakfast or for your snack time. Be sure to have a glass of water with you, if you are not used to highly spicy recipes. 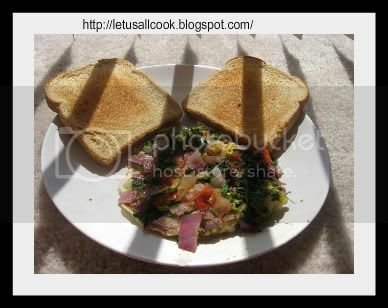 Omelette looks mouth watering!!! delicious omelette! !